Cheerful caterpillar invites little ones to climb aboard for playtime. 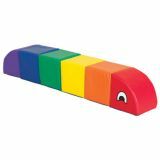 Multiple brightly colored rainbow blocks are soft and sturdy, with room for two or more children. Caterpillar can be turned on its side for added stability. For use on the floor only.